My sincere apologies to the few—but deeply committed—followers of this blog. It has been ages since my last post (a Cardinal sin, I know). What can I say? The folding of Gourmet during the Recession broke my heart, and with it, my passion for pickle girl slipped a recession of its own. Since that October, I've kept busy by having a baby, renovating a historic brownstone (still happening), and becoming a publisher at a revolutionary media company. But it took a night of serious drinking to reignite my fire. In the buzz of a rare evening out, I was stupefied to learn that--a mere block from my office--April Bloomfield's liquid gold is the ultimate whiskey chaser. 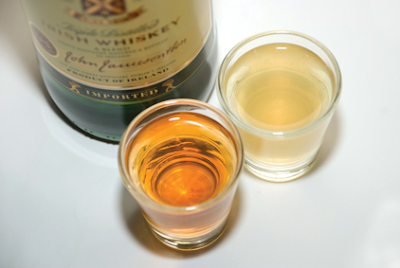 The Pickleback is the house drink at The Ace, and three of these had me scheming with colleagues to resurrect the pickle love. Stay tuned for a redesign, more original recipes, and updated, recurring columns such as, PicklePassport, Pickles in the News, and Chef Recipes. I really thought I would be spending my Monday morning recapping the wonderfully ridiculous International Pickle Day festivities. Instead, we were called into an emergency meeting to learn of Gourmet's demise. It is with heavy heart that I share the news of Gourmet's folding--nearly 70 years after its inception. The mission of the magazine has always been to open readers' minds to culture through the lens of food. Unfortunately, America prefers fast, cheap, and easy. Rachel Ray, Sandra Lee, Top Chef. The latest flashes in the pan are steering us towards instant this and 30-minute that. No style, no substance. pickle girl is all vinegar on this sad day. Happy October! This fall season brings a pickle worthy of its own theme song. When Gourmet.com reported that One Ring Zero was composing a tune based on these pumpkin pickles by Andrea Reusing, I could barely dial farm-to-fork favorite, Lantern Restaurant, quickly enough. 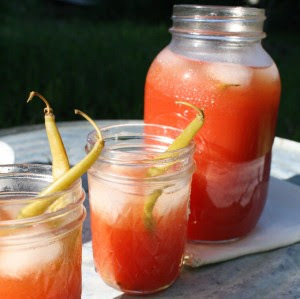 Special thanks to Andrea Reusing of Lantern Restaurant, for sharing this pickled pumpkin recipe. Use small, organic pumpkins or squashes. Before peeling, taste their skins; if they are tender, they can be left on. 2. When the sugar is dissolved, add pumpkin and cook gently, checking frequently, until the pumpkin is just tender. 3. Cool in liquid and refrigerate. pickle girl to Join International Pickle Day 2009! pickle girl, and my kindred pickle spirit, Pickle Freak, will be in the "Resources" tent at the Ninth Annual International Pickle Day on the LES this Sunday! Wear a costume and strut your salty stuff with the "big pickle" on the green carpet, then upload your photos to our flickr page! Price: Free. More information here. 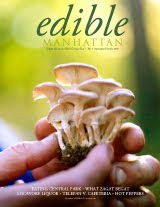 This just in, via today’s Tasting Table: Edible Manhattan will be celebrating its first year with a Fall Harvest Party this Saturday, complete with a dedicated Pickle Tasting Room! Pickle superstars Rick’s Picks, Horman's Pickles, and Brooklyn Brine Co. will be featured among the city’s other artisanal purveyors of the cheese, chocolate, and salumi varieties. South Street Seaport (Fulton/South Sts. ); buy tickets here ($40). A small dose of pop culture to get us through the week. To the serious foodies out there: I'm sorry. I couldn't resist. I’ll often pickle scapes, but this is the first time I have pickled bulbs (buying the soy-pickled variety from the Korean market doesn't count). This adapted Paul Virant recipe for fresh garlic conserve (via StarChefs) is served with roasted marrow bones and wood-grilled bread. I may end up eating this with everything from bread alone to duck confit nachos. Side note: Chef Virant is a pickle girl favorite. 1. Heat the oil in a sauté pan over medium heat. Add the garlic and cook until caramelized; add the sugar and continue to caramelize. 2. Deglaze with water and cook until the garlic is tender. 3. Deglaze the pan with the Champagne vinegar, add the salt, and remove from the heat. 4. 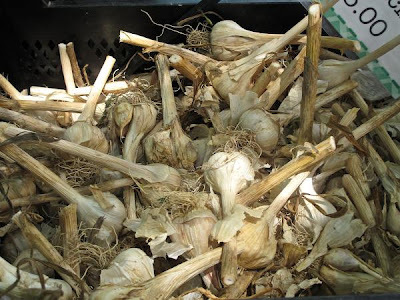 Pack the garlic into sterilized jars and process in a hot water bath. Congratulations to my friends at happy girl kitchen co.! The Guardian voted their spicy heirloom tomato juice one of the 50 Best Foods in the World. Pick yours up at the Ferry Building farmers market or order online. Labels: happy girl kitchen co.
We raced into Crotone with dreams of a three-hour seafood feast as reprieve from Calabria's oppressive heat. Sidelined by fishmongers slinging eel, sardines, and octopi, we talked into the siesta hours until every dining option was closed. Frankly, we could stand to miss a meal at that point. This happy accident introduced us to sardella—Calabrian caviar—one of the most obscure flavors in Southern Italy. 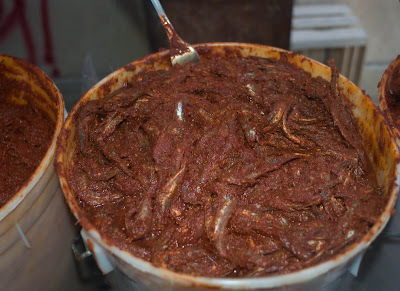 Keeping with the paradigm of simple Italian dishes, this paste is made of very few ingredients: salt, the region’s sun-baked pepperoncini piccante, and baby sardines, which are left to cure for six-seven months. Actually, make that newly hatched sardines. It’s a cruel world, but what can I tell you? It’s a delicious one too. 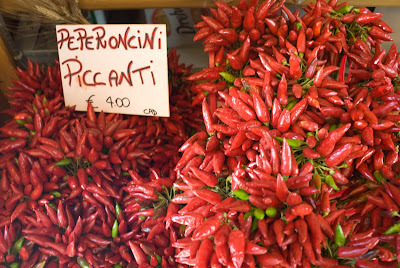 Sardella paste is sold from plastic buckets at weekly markets. My favorite pasta during this trip (this time I really mean it), was al dente spaghetti, finished in olive oil and sardella. It was at once sweet, salty, earthy. Six Euros of humble bliss. 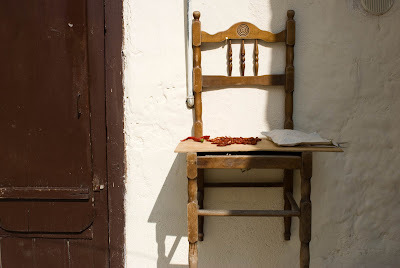 We also ate simple crostini spread with sardella all over Calabria. Its boldness an arm wrestle with the toe's fierce Ciro wine. Sadly, this nuanced, umami flavor was not available in cans or jars for the trip home. What I would give for some right now. The pickle jar was on a bench behind Olson, containing batteries and other unidentified objects. A pile of pickles was sitting on the bench in the park, along with a liquid that was presumably pickle juice, according to the police report. I hope they give this guy 25 to Life. 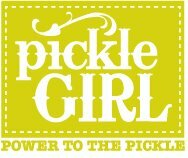 pickle girl harbors a deep, all-consuming obsession with unusual pickles and preserved foods. I’ll be culling venerable recipes, compelling news snippets, and insider tips from trusted culinary world sources as often as possible. I have been writing about travel and food for 13 years as an editor and media resource for tips and advice, travel trend information and data analysis. Over the years, I have conducted TV and radio interviews in markets around the country, including NPR, NBC, The Wall Street Journal, Fitness, Cooking Light, Cigar Afficionado, The New York Times and Wine Enthusiast. I have also served as a travel expert for Martha Stewart Living on SIRIUS XM Radio and was a regular guest on CNN before landing at Gourmet--the only epicurean magazine earnestly dedicated to travel.